Three fights in the first four seconds, two goals in the first 1:20, yet the Bruins couldn’t nail down the Stars until late in the third but came away with a 6-3 victory. Patrice Bergeron led the charge with a three-point night along with linemates Brad Marchand and Mark Recchi. Tuukka Rask made 10 saves during a five minute major penalty on Daniel Paille and 30 saves in total for the victory. Well, the Bruins were ready to fight right off the top. Gregory Campbell dropped the gloves with Steve Ott in the first second of the game, right off the draw. You should have known that something was up when Shawn Thornton was taking the draw instead of Campbell. Ott managed to bloody Campbell up in a nasty bout. Thornton wasn’t pleased with the result and decided to fight Krys Barch off the next draw. Thornton came out swinging, hard. Thornton pummeled Barch with uppercuts before taking a breather to stick his tongue out to the crowd. Eventually the fight got called off as Barch appeared to be hurt. Adam McQuaid, who I’m convinced only plays hockey because of an increased chance to fight, got into the party when he took on Brian Sutherby off the next draw. Three fights in four seconds. McQuaid made quick work of Sutherby, using his size and reach to get the easy victory. After that, the two teams decided to play hockey, well, at least the Bruins did. The Bruins would get on the board just 35 seconds into the game when the Bruins caught the Stars sleeping and broke down the ice. David Krejci led the rush and then feathered a pass to a streaking Milan Lucic at the last possible second. Lucic got the pass in stride and wristed it in for the opening goal. The Bruins weren’t done dominating the first few shifts however as Patrice Bergeron would pad the lead less than a minute later. Brad Marchand found Bergeron more or less in the crease with Andrew Raycroft before putting in the layup goal. This infraction was good enough to get Raycroft and his 0.00 save percentage benched. Tuukka Rask, although not tested consistently, was up to make big saves early on when he made a pad save on a 2-on-1 going right to left to do so. Finally, when you thought that the game started to settle down Andrew Ference had a go with Adam Burish after he fired a slap shot on Rask after the whistle. 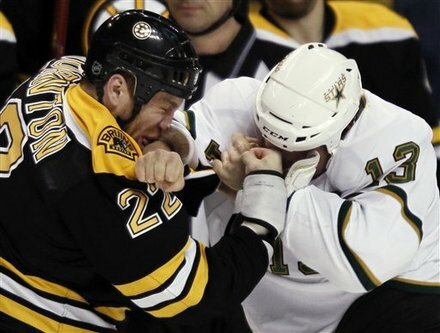 Ference, always one to stick up for his teammates despite being a less than great fighter, dropped Burish with a series of uppercuts and hooks. The Stars would get the first power-play of the game some time later with Rask looking strong despite riding pine for a long time prior to the game. The Bruins would kill off the penalty and then resumed to dictate their will in the offensive zone. Patrice Bergeron would score his second goal of the game, in very similar fashion to his first goal when, once again Brad Marchand found him with a nice 2-on-1 pass as Bergeron charged the net. The goal gave the Bruins a three-goal advantage as the Stars appeared that they had no idea how to play in such a physical game despite being one of the top teams in fighting majors. Kari Lehtonen actually kept his team in the game for a time being, as weird as that might sound. He made numerous good glove saves as his defense continued to look lost and weary of contact. The Bruins won puck battles at will and came close to scoring on various occasions but were stoned. Shawn Thornton fired a shot that Lehtonen could not save, even on a great night. Thornton raced up the right side and fired a bullet glove side high that beat Lehtonen clean. You could see Lehtonen’s body language sag after that as if to say that all of his efforts are for not. The referees, sensing that chippiness was going to boil over, put both Zdeno Chara and Steve Ott in the box after a post whistle conversation. It didn’t seem to deter the Bruins as it appeared that Adam McQuaid scored a few shifts later. Blake Wheeler had been camping out front and McQuaid beat Lehtonen with a nice glove side wrist shot but the ref immediately waved it off, sighting that Wheeler had interfered with the goalie, which he had not. Claude Julien, already pissed about Chara going to the box, was livid about the call, but a four-goal cushion kept him from throwing sticks over the boards. The Stars would show their first signs of life midway through the game when they got on the board on a Karlis Skrastins goal. Adam Burish charged into the zone, breaking through a weak Bruins trap, and then fisted a saucer pass on the backhand to Skrastins in the slot. Skrastins fired low glove side, beating the butterflying Tuukka Rask low post. The game continued to be very physical, the next incident of which being when Daniel Paille made a borderline blindside it on Raymond Sawada as Sawada charged into the zone. The hit landed high and Sawada was noticeably woozy after the hit. The incident resulted in a scrum and led to penalties both ways, the most important being Daniel Paille getting a major for elbowing. Tyler Seguin would serve the penalty as Paille was given a match penalty. The five minute power-play could go a long way in springing the Stars back nto the game in a hurry, especially with Chara in the box for a 10 minute misconduct for having a conversation with Ott. Tuukka Rask came up huge on the five minute penalty-kill, making saves on redirections, shots through traffic, and a huge glove save late in the penalty to keep the Stars at bay despite relentless pressure and 10 shots on the power-play. Rask made sure to remain calm with every post whistle scrum and every Star in his crease. The Bruins would carry over a power-play of their own when Brad Richards was called for tripping. The Stars would get themselves back into the game when Brenden Morrow rifled home a shortie over Rask’s blocker. Steve Ott broke out towards the net before stopping abruptly, springing Morrow and giving him room to pass to. Morrow caught the puck and wristed it home in stride to get the Stars within two goals very early in the second period. The Stars would get another one shortly after when Brad Richards one-timed one past Rask from the left side. The Bruins had been sleeping for the beginning of the period and the Stars started to climb the momentum ladder. Richards dropped down to nearly a knee and fired a dart over Rask’s glove hand. The Butterfly goaltender went to his bread and butter too soon, leaving the top of the net open. Tyler Seguin would come up with a huge goal just a few shifts later when he hammered a turnaround shot from the left circle in past Lehtonen. Wheeler did a good job of chipping to Seguin in the circle and Seguin’s fast release caught Lehtonen unready to save. Unlike Rask, Lehtonen was late in getting down in the butterfly. The Bruins would then settled back into the game, using their legs and physicality to earn the game’s next power-play. The Bruins, despite peppering Lehtonen and staying in the zone for much of the time, couldn’t beat Lehtonen but they did bleed two minutes off the clock and get back some momentum. The Stars would pull Lehtonen with 2:42 left in regulation down by two goals. Bergeron took a shot at the empty net for a hat trick but hit the apron. However, he did get his rebound and wheel a pass out front to Brad Marchand who put it in for the game-ender. The Bruins will next host the Sharks.